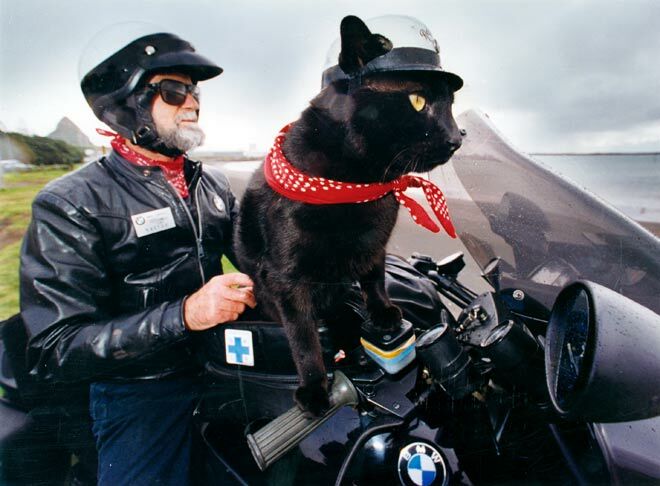 In the 1990s Rastus the cat loved cruising the highways perched on the handlebars of owner Max Corkill’s motorbike. Rastus had his own custom-made goggles and helmet, worn with a red bandanna. He and Max helped raise money for the North Taranaki branch of the Society for the Prevention of Cruelty to Animals (SPCA). After Rastus and Max were killed in a head-on collision in 1998, they were mourned by bikers and cat lovers throughout New Zealand.